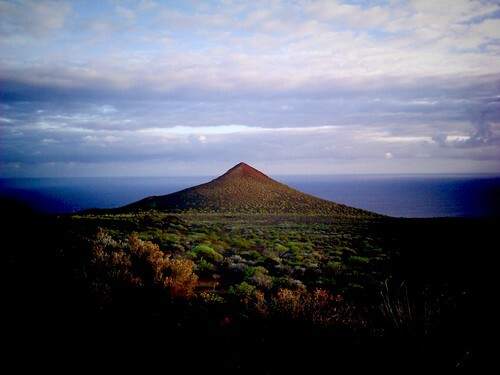 El Hierro is one of the islands that make up the popular beach/sun destination the Canary Islands. It’s certainly an interesting island, noted in the mainstream press for it’s renewable energy sources, but often overlooked at times as a tourist destinations as it’s the smallest of the Canaries. The island is a UNESCO Biosphere Reserve, with 60% of the island protected. It’s known as “Isla del Meridiano” – the Meridian Island – because as the far western island of the canaries, it was believed that this was the zero meridian, or the end of the world. Getting here isn’t too difficult, as there is both a small airport as well as a ferry terminal, each connecting you to Tenerife. The island is certainly a place to relax – it isn’t quite the end of the world these days, but given its remote location, it isn’t as popular as some of the other islands, making it just a touch more idyllic. Beaches aren’t as plentiful here on El Hierro which is the downside, but you can still easily get some sun. You’ll want to stop by Playa de la Verodal, an often-photographed beach with red sand and turquoise water. It’s in the far far west but worth the visit. Otherwise just enjoy lounging on the hotel terrace or splashing around at any of the amazing natural swimming pools – many can be found in the northeast. I’ve written before about hiking in the canaries and as the smallest of the Canary Islands I think El Hierro is great for stretching your legs. Most hikes lead to El Sabinar, the highest point on the island, though you can easily find some paths that skirt through beaches and towns for something shorter or less strenuous. Cycling, horse riding and paragliding are just some of the active sports options. And while I’m not a scuba diver, many say it’s one of the best spots in Spain to Scuba. It’s worth noting that having a car on El Hierro is recommended to make getting around a lot easier. You’ll find hotels clustered in two main areas. The first is Frontera, on the western side of El Heirro. This is a great spot for those hiking trails I mentioned earlier, and there are some diving centres in this area also. And of course all the amenities you’d expect – restaurants, clubs, bars, etc. The other is Valverde, which is El Hierro’s capital. This isn’t a beach town per se which may sound like a downside, but it’s at a higher elevation which means you get some spectacular views. It’s a popular jumping off point for the rock pools around Tamaduste and Echedo, which are great for a swim.